Teltonika FMB640 is an advanced and leading GNSS/GSM/Bluetooth GPS Tracker device for advanced applications. Teltonika FMB640 is GNSS, GSM and Blue-tooth terminal for PROFESSIONAL applications. 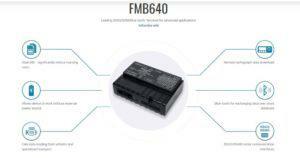 FMB640 is designed for complex solutions, where one device can do multiple tasks. FMB630 features like FMS CAN data (J1939), fuel CAN data (J1708), tachograph live data (K-Line), remote tachograph file download, various third party RS232 or RS485 devices support and Dual-SIM will maximize your fleet efficiency. The terminal is suitable for applications like international logistics, refrigerated transport, agriculture, construction & mining, security & emergency services and even more. Click here to download the instruction manual in English.